Choir Director Philip Copeland credits the talented students and faculty at Samford for their excellence and hard work. Copeland also notes that this year’s choir is made up of 21 new members and that they have maintained the high standards of work ethic and performance quality of recent ensembles. This is Copeland's third appearance on the ACDA stage as conductor. This May, following the graduation performance, the choir will travel to Poland where they will visit Auschwitz, the Salt Mines, and give a concert at St. Mary's Basilica, which has its foundations in the 13th century. 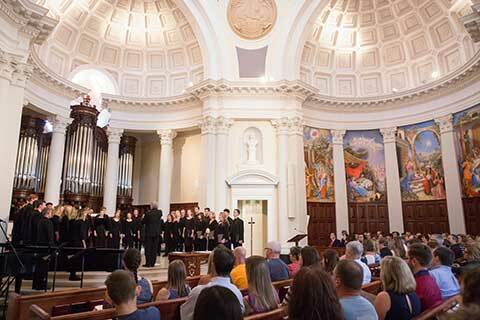 From there, the choir travels to Budapest, Hungary to compete in the Laurea Mundi International Choral Competition. After four days there, they travel to Bratislava, Slovakia and then to Vienna, Austria.